Providing our patients with the very best service and quality. It’s an exciting time for dental care right now and our integrated laboratory, staffed by highly qualified professional dental technicians, is in tune with the latest advances in technology taking place.Today, we can offer our patients choices in all ceramic crowns and bridges using the latest in CAD/CAM technology. Zirconia and pressed ceramic tooth coloured materials allow us to fabricate restorations of outstanding strength and aesthetic qualities when used in the right situation.These materials are not suitable for all cases and supplement our highly successful porcelain fused to metal crown and bridgework using the very best of biocompatible high gold content alloys. Your dentist will recommend the best choice for your situation. Together with the latest advancements in implant tooth replacement, the laboratory provides a complete service to the practice. This includes porcelain veneers, individual custom dentures, implant guides, splints, snore appliances and mouthguards with, as always, an emphasis on technical excellence. Having our own laboratory gives us the ability to provide our patients with the very best of service and quality. This is of particular benefit to our out of town patients who often require a quick turnaround or simply time poor patients that require immediate treatment. Similarly there are always those emergency situations that require involvement of the laboratory such as a broken tooth, broken denture or lost mouthguard, always at the most inconvenient time. Our experienced technicians work in close co-operation with our dentists to achieve the most outstanding results for our patients. With an increased awareness of health and wellbeing today we guarantee our patients that Medland Dental Centre does NOT out source any work offshore and that all materials used to fabricate your restoration are fully T.G.A approved. 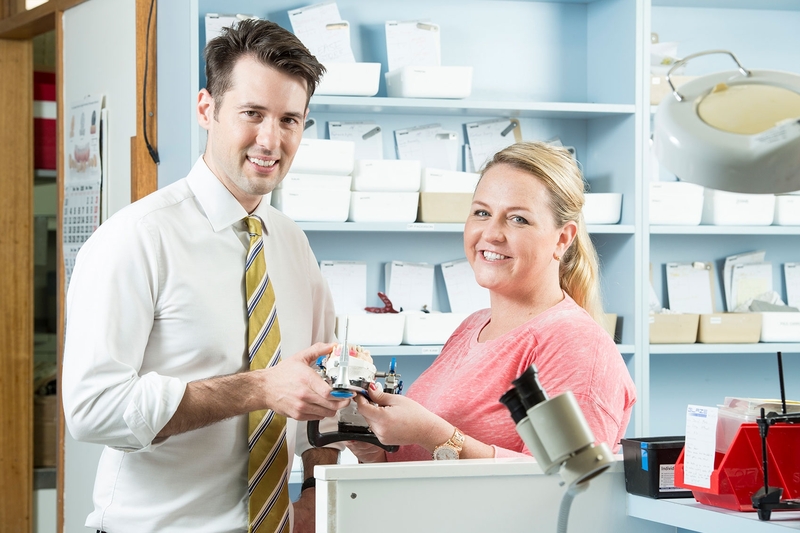 All of our laboratory technicians are registered by the Dental Technicians Board of Queensland.